Marjorie Lajoie and Zachary Lagha of Canada have qualified for the 2018-19 Junior Grand Prix of Figure Skating. 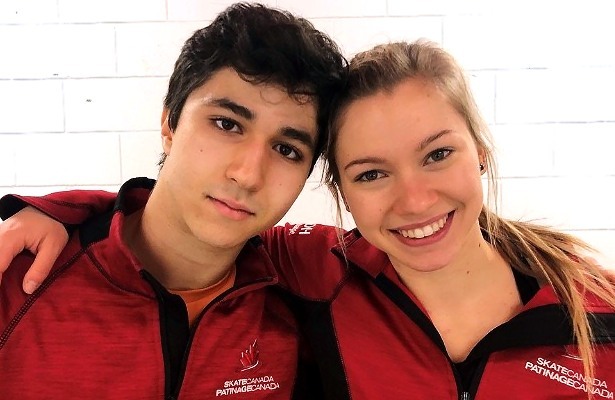 Two-time Canadian junior ice dance champions Marjorie Lajoie and Zachary Lagha have had a great start to the 2018-19 figure skating season. The team had two good outings at their Junior Grand Prix (JGP) events, placing second at JGP Austria and first at JGP Canada. The ice dancers are currently coached by Marie-France Dubreuil, Patrice Lauzon, Romain Haguenauer, Pascal Denis, and Josée Piché. Dubreuil and Haguenauer also focus on the choreography. Last season, the team trained alongside Olympic Champions Tessa Virtue and Scott Moir, who Lajoie looks up to. “It was really inspiring to see how constant and intense they were in training every day, and watch them perform just the same way in competition,” she said. This season, the team is skating their Rhythm Dance (RD) to “Perro Viejo,” “Otro Puente Alsina,” and “Essa,” by a group Lagha found called Otros Aires. They feel this dance is much more difficult compared to that of last season. At first, the team struggled to find music for their free dance, however, when Lagha proposed “Warsaw Concerto” by Richard Addinsell, everyone agreed it was a good choice. There was marked improvement in both dances at JGP Canada, which was held in mid-September. Combined with the silver they won in Austria, the team qualified for the Junior Grand Prix Final which will be held the first week of December in Vancouver, B.C. “We actually changed half of our footwork and we focused on the turns for the training week that was before,” Lagha explained regarding the level three they earned in their midline steps in Richmond. The team also earned a level four on the dance spin and a level three on the diagonal steps. Their win wasn’t that much of a surprise as they felt they had worked hard to improve since the JGP in Linz, Austria. While the JGP Canada champions are making changes to their dances, they also plan to continue to improve their lines and connection. The ice dancers from Quebec have recently begun working with a performance coach and hope this will pay off at the JGP Final. Lagha agreed, adding that he hopes they are able to deliver two solid performances in Vancouver next month. Lagha is currently a student in CEGEP (Collège d’enseignement général et professionnel) while Lajoie will begin CEGEP next year. When not training, Lagha likes to spend time with friends and also enjoys playing the piano, which he began playing when he was 4. Most recently, he reached the final round of the edition 2018 Canada Music Competition after performing a complete program of the piano repertoire, including the first movement of Tchaikovsky piano concerto no. 1, which was also played with an orchestra. Lajoie is a professional actress which she says helps her in skating. Titanic is my favorite movie!” said Lajoie, while Lagha added that Shutter Island is one of his. Lagha also enjoys Reggae. “Actually, my team leader caught me singing in the shower when we were competing in Australia. When I went to the rink the next day, he told me I sang really bad,” he laughed.